You’ve heard plenty of talks about why visuals should be part of your content strategy. But videos, images, and GIFs are also super useful behind the scenes—in the content creation process itself. 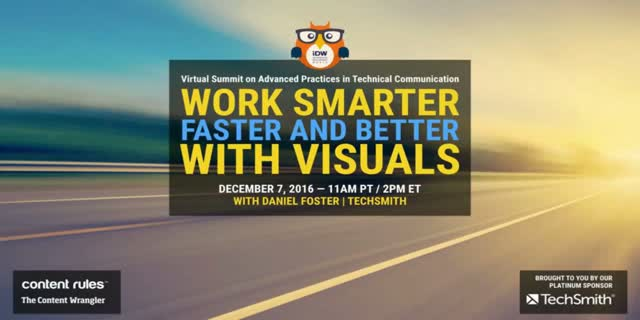 Join Scott Abel, The Content Wrangler, and his special guest, Daniel Foster, Team Lead for TechSmith's SnagIt, for this session on using and creating better visuals. Daniel will share real-life examples and workflows that will save your team time and avoid rework—from planning to production, to publishing and beyond, and how to use visuals that can pump up your team’s productivity. Attendees will learn how to speed up the content creation process, establish a shared vision during planning, reduce confusion and re-work by improving the review and the feedback loop, streamline publishing by documenting best practices, and how to connect stakeholders and internal audiences with your fabulous content.